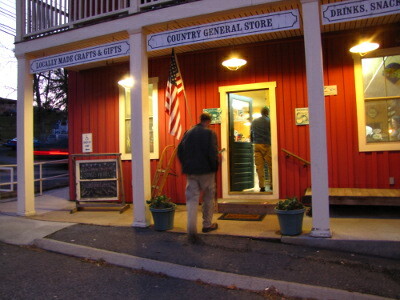 Steve Hopp started the Harvest Table Restaurant in Meadowview, Virginia, based on the concepts outlined in his wife's book, Animal, Vegetable, Miracle. The restaurant "work[s] with seasonal produce and meats from local and regional sources, offering the best of each season." 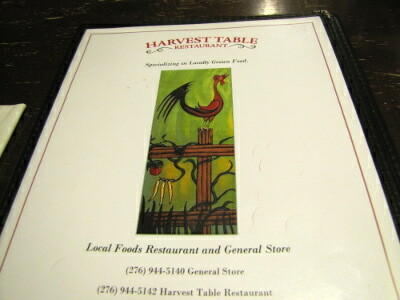 For those of you who live far away (or can't afford the high prices), the Harvest Table could provide a simpler lesson. Keep an eye on their specials on facebook for ideas about cooking totally in-season meals of your own. 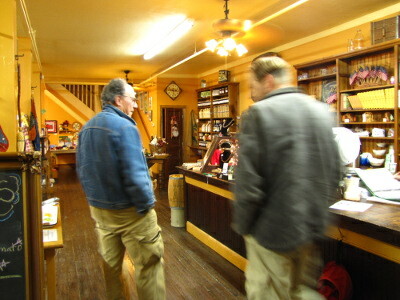 Or drop by the restaurant to check out their selection of permaculture books and local crafts. Our chicken waterer makes care of the backyard flock easy and clean. I like your main point in this a whole lot. The Harvest Table prices are way too high for food of any kind. I think they are right on in the idealism of eating local and preparing it slow. But they need to figure out how to include more of the down and out population. We all are not farmers. And though the world might be much better if we were, we have a long way to go. Maybe their prices would go down if more people were vocal about our lack of funds. Interesting idea. I've noticed that most restaurants don't know what the word "seasonal" means. Go pretty much anywhere and order the "seasonal fruit" instead of fries with a lunch meal and you will get grapes, watermelon, and cantaloupe. No matter when in the year it is. It's unfortunate that they're doing such a neat thing yet aren't able to turn a profit. I wonder how much the cost of the building and all the furnishings for the place contribute to the inability to make a profit. Maybe a model of this business done out of one's home might work considering the lower overhead with working out of ones home? I love their idea, I would really like to see it work. Maggie, it's unfortunate that some people wouldn't be able to afford to eat in their restaurant. But considering they're already not making a profit, how can you expect them to lower their prices further? I can't afford a new truck, should Ford and GMC lower their prices to accommodate me and not make a profit? If they can't make a profit then they won't be able to keep their doors opens or make a living. And I would be willing to bet they employee people that would like to keep their jobs. Maggie --- That's what I've been trying to decide --- are their prices way too high, or are we just so used to corporate agriculture that we're not willing to pay how much food really costs? And if good food really costs that much, what can the poor eat? Edward --- I know what you mean --- I ordered that exact dish while we were on the road last week and got exactly what you described. I think that in menu-speak "seasonal" means "we want you to think this is fresh" and has nothing to do with actual seasons. Heath --- Smart ideas about thinking outside the box to make the food more available! I should have thought of that since that's basically the theme of our Microbusiness Independence ebook --- delete the physical storefront and you can lower prices and still pay yourself a living wage. I was reading somewhere about a lot of people doing just what you said to sell good quality food on a small scale. I believe you can even get around dealing with all of the health department stuff if you are a private club instead of a public business. The green revolution enabled a large increase in yield for a lot of staple food crops. One of the three main causes is cheap fertilizers made from and with with fossil fuel. (But it is estimated that improvement in irrigation and development of high-yield varieties were both equally important). Roland --- That's all very true, but all of those methods made food cheap by degrading the environment. That's the reason some people are now trying to move back to buying local, organically grown food. The question is --- can food that's better for us and for the environment be affordable for the general population? OK, I am going to go out on a limb here. I am not well versed in local farming so I will leave that to the experts. But I see a solution here on two fronts. First, Anna didn't mention the author of that book is the best selling writer Barbara Kingsolver. And Anna is a writer too. I wonder the correlation between local food growers, sellers and book sales. If people spent more money on good books like Barbara's and Anna's or my little chapbook (located in the Harvest Table store) that would put the money in the right hands! Interesting that the Times article compares prices with Applebee's. I've been to the Harvest Table for $15 (no dessert). I remember that meal fondly, if I've ever eaten at Applebee's it was forgettable, but looks like their main courses range $10-17. That the use of fossil-fuel based nitrogen fertilizers is not sustainable is something I'll readily agree to. But I have to disagree that improving irrigation and breeding different varieties of crops that give more yield is inherently damaging to the environment. Here in the Netherlands we've been managing water in one way or another for hundreds of years, out of bare necessity. (mostly to keep our feet dry ) Managing water can be done without harming the enviroment. And trying to improve crops by breeding and selecting (i.e. exploiting essentially random variations) different varieties is also not something new. It's just done with science and a better understanding of genetics these days. Maggie --- I actually mentioned Barbara Kingsolver in the first sentence of the post, but not by name --- just linked to one of her best-known books. I'm not sure I see how books are going to make food more affordable, though? Joey --- There is a good range of prices at the Harvest Table, so you could get in and out pretty cheaply if you don't want vegetables. Mark's burger was $7, I think, which is definitely comparable with other places. 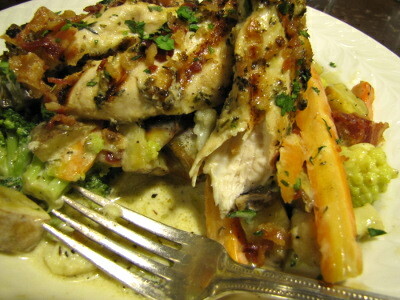 On the other hand, my chicken carbonara was $19 (!! ), maybe because it's tough to find pastured bacon? We've eaten at Applebee's on our recent trip up to Ohio, and I'd agree with your forgettable assertion. The food is fine, especially if you ask to replace the potato side with some sort of vegetable, but it's true that the salads are iceberg (or maybe romaine) lettuce. Portion sizes are definitely larger, though, so I'd say you get about 3 to 4 times as much food per unit money at Applebee's as at the Harvest Table. I definitely don't want to just throw away all of the recent advances in agriculture, but I do think we need to analyze each "advance" to see if it really did send us forward instead of backward. I am wondering how their costs break down in terms of purchased foodstuff vs wages vs building/overhead costs. They may pay better wages too. Not sure there is any reasonable way to calculate it, but it would be curious to see an estimate of the cost of some of your meals if you included your hourly usual wage for the time spent growing and preparing the food, not to mentions all the other costs for seed, infrastructure, etc. I bet you'd have some inexpensive meals and some very expensive meals (esp those with meat). Of course, I know you enjoy how your time is spent and the health benefits from your diet so it is not an issue for you. If everyone had to pay these kinds of (truer) costs for food there would be widespread panic but everyone would have a garden. We could do better if we got used to the idea of working "hard" to just survive (stay warm, have enough to eat) rather than "get ahead". People go into business to make a profit, thinking that the more they invest in marketing, nice store, etc -- the higher or more likely a ROI. This is capitalism, which most people are realising, is defunct on a planet with finite resources. (Consider though, with 7 billion people, what seems not be finite -- human beings -- how scary is that when you consider what people will do in pursuit of "profit") The solutions are obvious -- less indivudual consumption and more individual restraint. Our biology (instincts, urges, emotions, fears) is so unevolved compared to our culture and technological capabilities -- we're on the path to self-destruction, or, to be more optimisitic, the evolution into something not quite / more than human. Just wanted to add one more piece of food for thought on this topic. Restaurants in general are a pretty bad investment. The one year failure rate for new restaurants is about 25%. More than half fail within 5 years. So it's entirely possible that their failure to turn a profit has nothing to do with their business model but the industry. I do recall hearing about similar restaurants elsewhere that were successful.